Today we're taking a little time off from our regular schedule for an interview on the front porch. A what? Well, the fun folks over at Porch.com decided to share my blog as their weekly feature in their "On the Front Porch" series and they sent me a list of 16 quirky questions to answer. They have the first 8 over on their site, and I'm sharing the second half here. 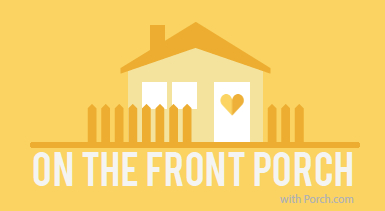 If you're not familiar with Porch.com, they're a great resource for finding quality professionals to maintain and improve your home. Want to know some fun, trivial things about me? Read on, but try not to judge! Here are the 2nd half of the questions. Q. If your life were a song, what would it be? A. Several songs come to mind, but probably "Living on a prayer" is the best fit for me. My daughter suggested "Hopeless Wanderer" by Mumford and Sons. Is she trying to tell me something? I do love their music, for sure. And the video really is funny. You should watch it. A. Pinterest for sure. I could spend hours on there. I remember when I discovered it way back when you had to be invited to join. My jaw dropped at all the inspiring photos. Are you following me? If not, go here. Q. If your walls could only be painted one color for the rest of your life, what would they be and why? A. Benjamin Moore White Dove. It's the perfect backdrop for everything. 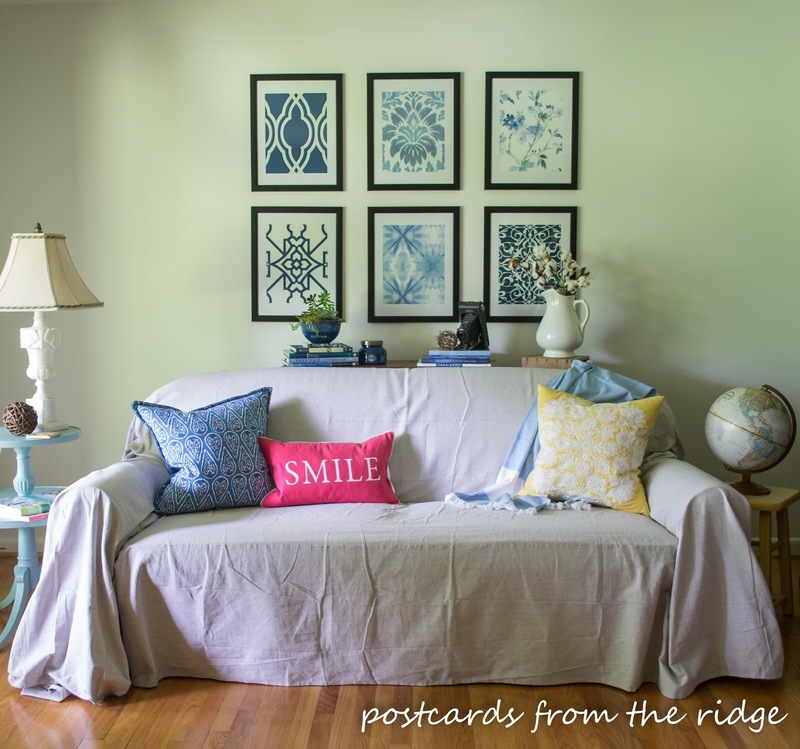 It's the color on our trim throughout most of the house and the walls in our living room. A. Besides using my toes to pick things up off the floor, I'm kinda good at putting together paint color schemes and design elements for other people. I love working with local and online clients to help their dream rooms come to reality. 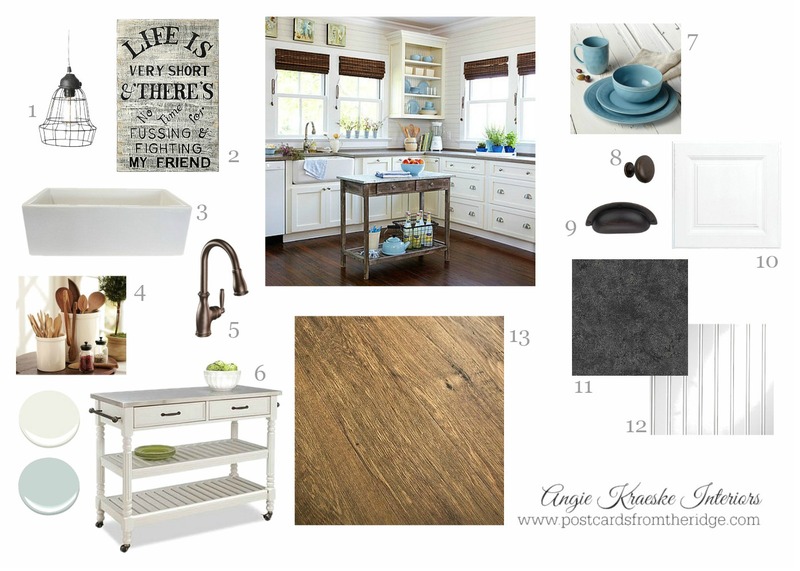 Here's a mood board I did for a local client who gave her kitchen a farmhouse makeover. It makes me want to completely redo our kitchen. Go here to learn about my design consulting services. Affiliate links provided for your convenience. For full disclosure go here. Q. What’s the weirdest thing you’ve collected? A. I have several collections at our house. Some people might say hoards, but that's not a very nice word and I don't like to use it. So, the most unusual collection is my vintage board games. They're nostalgic and cool. At least that's what I tell myself. I decorated our mantel with them a couple of years ago. You can see what I did here. Q. 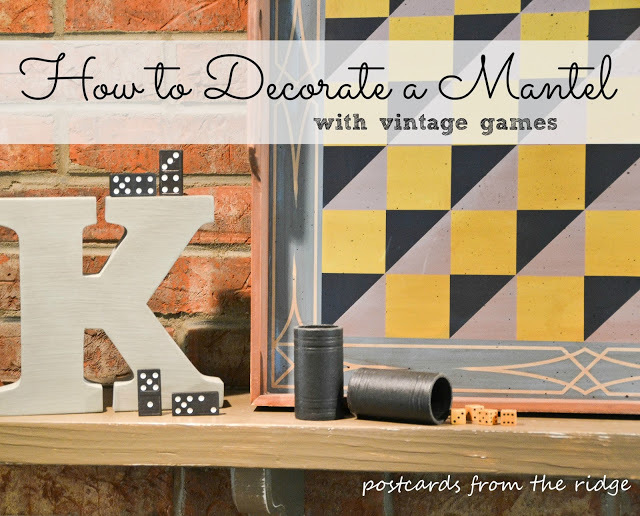 Show us your best project for a DIY beginner! A. Painted paneling. It's easy with the right tools and products and can make an older, dated room look 100x better. I wrote a tutorial for it here How to Paint Paneling like a Pro. Q. What’s a home trend you hope doesn’t exist in 100 years? A. That's a tough question. There are things about most trends that I like, but I wouldn't miss it if I never saw any animal print fabrics again. I'm not even sure if it's even a trend, but I never really liked it. Q. Favorite words to live by? A. "Logic will get you from A to Z. Imagination will get you everywhere" - Albert Einstein. Isn't that the truth? The world is not black and white and we must open our minds to all of its possibilities. Hop over to Porch.com to read the first half of the questions. 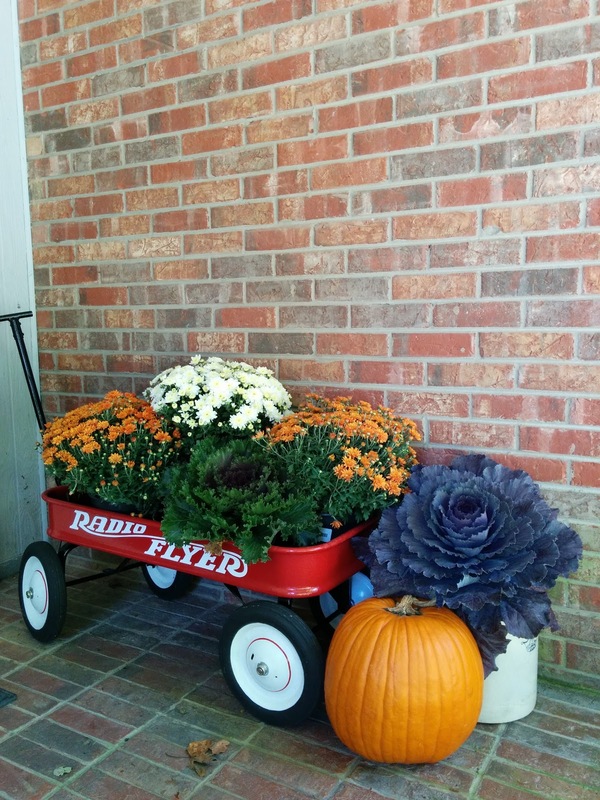 And since we're talking front porches, here's a snap of our front porch decor this fall. I took this about 3 weeks ago and the mums don't look near as pretty now. What is it with mums? The pumpkins and ornamental cabbages still look nice though. Now I have a question for you. What's the weirdest thing you collect? Fun interview, Angie! You are a talented decorator. I'll bet that your client was thrilled with her mood board. Thanks Paula. I love her mood board! Makes me want to change everything in our kitchen! I have a small collection of camels. Some started life in nativity scenes and others were found on my junking travels. It's nothing I'm passionate about, but I find them more interesting than, say, dogs or frogs. I bought two a couple of weeks ago at a yard sale only to be informed they were LLAMAS! So much for animal identification. Haha. That sounds like something I would do with the llamas!